I decided to splurge yesterday. I woke up wondering what workout I would do, and realized I didn't feel like doing any of the DVDs I had. Yet another example of me being five years old: I get tired of all my new toys quickly, even if they're still shiny and pretty. 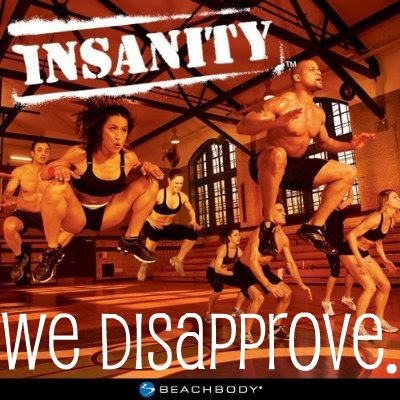 Um... Insanity anyone? Still waiting for me to hate life enough to give it another shot. I had some returns to make at Target, and I swear it's impossible to go to Target and not purchase something, even if you need nothing. So obviously I ended up in the fitness aisle, staring at a variety of torture inducing workouts. I finally decided to pick up two Jillian Michaels DVDs: Yoga Meltdown and Ripped in 30. I was a little hesitant because let's face it... She's evil. I've had 30 Day Shred for a long time now and only pull it out every once in a while because I can't deal with it more often than that. Anyone who actually does the 30 days of that thing is a rockstar and deserves a medal. It is a tough workout, and I don't doubt that it is incredibly effective... But she's annoying! 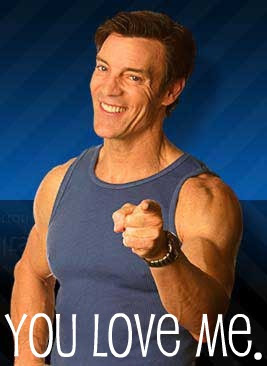 And this is from someone who went through the whole 90 days of Tony Horton and didn't punch the television. So I must have a higher tolerance than I thought. That being said... I was pleasantly surprised by both workouts. They were both a little rough in their own way (who knew yoga could hurt that much?!) but great! I loved that Ripped in 30 followed the same circuit format that 30 Day Shred used, but I thought the moves were much better. And Yoga Meltdown was exactly the workout I've been looking for lately - a mix of stretching and bodyweight exercise. I struggle calling it "yoga" because... Um... It's Jillian Michaels, and she says things like "who's your daddy?" Not exactly the typical yogi one imagines. But let's be honest, if I can end up looking like that... I'll put up with her craziness. OMG. I have that same Jillian yoga DVD and did her workout last night for cross-training. Honestly, I put her on mute because hearing her say "Who's your daddy?" sounded like nails on a chalkboard and whenever she bellows "You need to learn to get comfortable with being uncomfortable! ", I flip off the TV.